Rooibos herbal tea has a slightly sweet and fruity flavor that can be enjoyed plain hot or cold. The traditional South African rooibos is served as a hot beverage with milk, sweetened with sugar or honey. 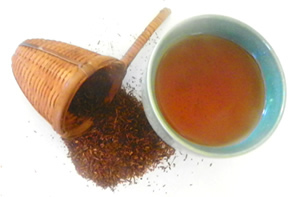 It is often blended with honeybush, another sweet, red tea from South Africa. Rooibos is a great base for herbal blends, combines well with ginger, cinnamon, vanilla and mint. Recipe Instructions: Herbal Tea :Use a scant teaspoon of rooibos tea leaves to each cup boiling water. Infuse for 3 to 5 minutes. Use a fine mesh strainer, the tiny leaves go right through the holes of most green tea strainers.